Take a private 5-hour tour of the greater Santa Monica area including Venice Beach and Marina del Rey in your custom Electric Escalade Super Limo. Your group of up to 14 guests will be picked up at your hotel (or other location) and take you to your restaurant of choice for either lunch or dinner. You will make one additional stop at a bar or lounge of your choice (or choose from our recommendations) for a fun-filled day or night before returning your group back to your original location. Our recommendations for stops during your tour include the Santa Monica Pier, Third St. Promenade, Main St. Ocean Park, Muscle Beach, Venice Pier, Bora Bora and the hip Abbot Kinney Boulevard. Your group of up to 14 guests will be picked at your hotel (or other location) and take you to your Restaurant of choice for Lunch or Dinner. You will make one additional stop at a Bar or Lounge of your choice (or choose from our recommendation) for a fun-filled day or night before returning your group back to your original location. Your driver will arrive 15 minutes prior to your pick up time to ensure a smooth departure. 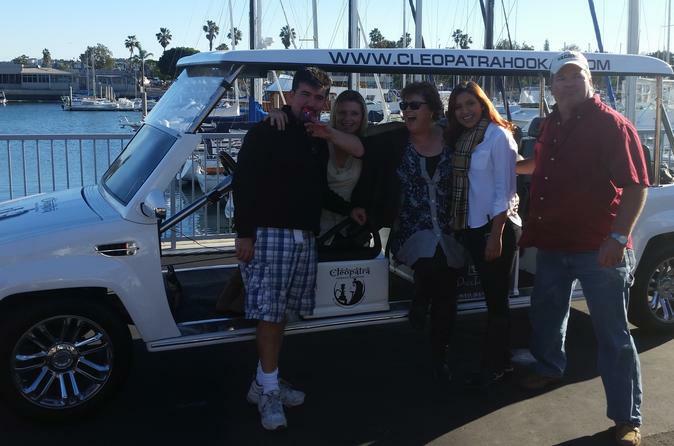 Since this is a custom private tour, you will have options on where to travel and your driver will be glad to accommodate you on your journey through the heart of the greater Santa Monica area. Our recommendations for stops include Santa Monica Pier, Third St. Promenade, Main St. Ocean Park, Muscle Beach, Venice Pier, Bora Bora in Marina & hip Abbot Kinney Blvd. All you have to do is show up and board your Electric Escalade Super Limo!